The recession (are we out of it yet? Please God!) has seen a boom in online discount vouchers and coupon codes. But the question is, do they really work? Do they really improve your ecommerce conversion? Clearly they work for the cashback sites, such as Quidco and Topcashback, who are amongst the best performing affiliates in the affiliate marketing landscape. However, we recently conducted an audit for one of our ecommerce clients and discovered that their cart abandonment rate - a key metric used to monitor ecommerce conversion - was being severely impacted by shoppers entering incorrect, invalid or out of date discount codes. Certainly the boom in cashback sites seems to have had exerted pressure on ecommerce retailers to join the bandwagon, not least because they see the huge amount of traffic going through these sites, and they want to get exposure to it. Not every retailer will want to be involved - it might not fit with their brand values - but in the mid and lower end of the market, the demographic fit can be a good one. However, managing them properly is not an easy process, and all too often the resource is not there to keep on top of a rapidly changing roster of offers and promotions. This is partly down to the lure of technology - cashback and other online publishers have all kinds of XML and API wizardry to make the retailers life as easy as possible, but data feeds get stuck, don't get serviced properly, and all too often fail - and more often than not there's no one to double check. Dependence on tech, and the false sense of security it gives, can be a dangerous thing. Result? 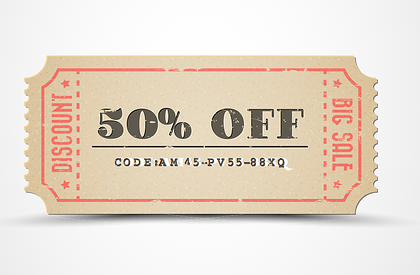 Coupon codes in circulation long after their sell-by dates. A second problem concerns segmentation. As a way to target different customer segments and get the most value out of a wider range of potential shoppers, discount codes can be useful - every retailer will have a mix of more price conscious customers, who they would like to attract. However, to do this properly, each set of customers must be kept as far away from the other as possible. For example, there is nothing so irritating - and frustrating - than running through the checkout process only to be confronted with that teasing message "Enter your discount code here (if you have one, ha ha)". This was exactly the problem we identified with our client - the point where your ecommerce conversion nosedives and you lose a quarter of your customers, those who are price conscious but not so price conscious that they would not have spent the full price anyway, having got so far down the checkout process. But faced with a tempting but empty coupon code box, they race off to the cashback sites to try and find a code to put into it. The end result is a lot of unhappy customers and money left on the table. There's also potentially a third problem, for those who belong to an affiliate network. Cookie-hijacking. For all those people you have sent away to find a coupon code and who have come back empty handed, you will still find yourself having to pay a commission to the affiliate network because, lo and behold, the affiliate sites have dropped a cookie on your visitor and tagged them as THEIR customer. Last click wins, remember? So if you are in the affiliate business, keep your eyes wide open! The moral is, if you are going to consider coupon codes, make sure you have the resource and technical capability to manage the programme properly, choose your affiliate partner carefully and, above all, keep your coupon code customers well away from your regular clientele - for example by means of a unique url parameter, and targeted offers. Then the coupon code will be only visible to them, and your regular shoppers will never know there was one on offer, and they won't be tempted to go off and search for a coupon elsewhere and come back with a cookie instead. And if you do want to include a 'Got a coupon code?' message on your website, to capture all that cashback traffic, have an easy 'out' for people who don't have one, and be prepared to give something away to everybody - for example 5% for signing up to your newsletter, or sharing your page on Facebook. In short, make it easy for them to join the fun. The other way is a bit like sitting on a Ryanair jet, and getting a great big sticker in your face - yes, we all know the guy sitting in front of us has paid less, but what we don't need is a socking great notice pinned to the back of his seat - I got a 25% discount. What did you get?